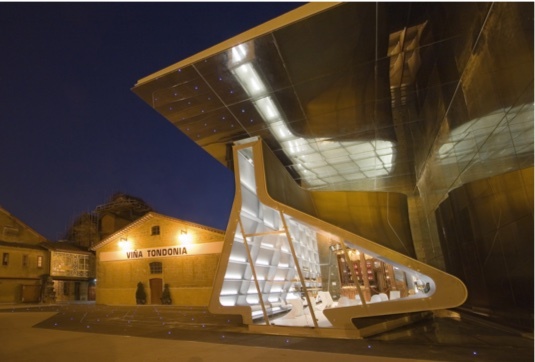 Rioja’s wineries include some of the most spectacular modern and historic architecture in the world. 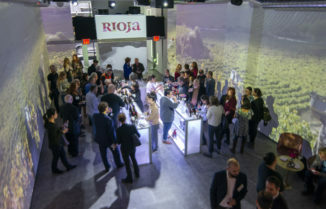 While the region is home to some (some other word than GREAT) older buildings, the bodegas constructed in the last 20 years have been particularly influential. 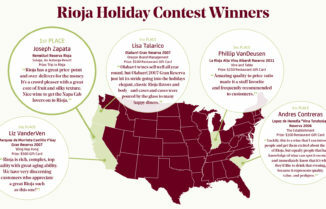 Here, we’ll explore how some of the world’s most innovative architects, including Santiago Calatrava, Frank Gehry and Zaha Hadid, who helped build Rioja into a destination for modern architecture. 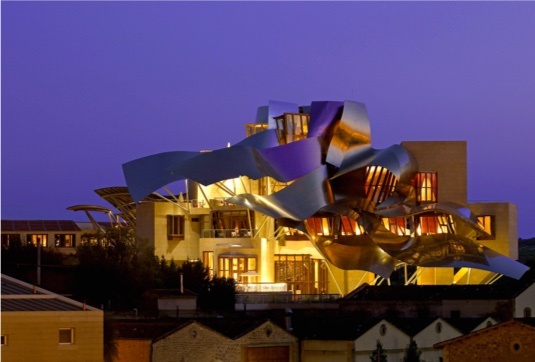 Traditionally, wineries in Rioja are not open to the public, but Marqués de Riscal broke the mold – when Pritzker Prize winner Frank Gehry created the new structure in 2006, it was built as the center of a new City of Wine. The building is a series of rectilinear elements, clad in sandstone, combined with sweeping panels of gold and pink titanium, and mirror-finish stainless steel. The structure evokes a joyous ribbon wrapped around a present. 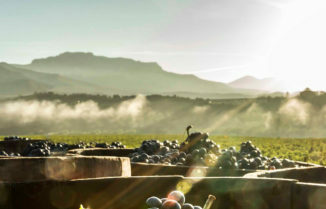 Along with the winery, the complex is also home to a luxury hotel, restaurant, and the Caudalie vinothérapie spa. To celebrate their 125th anniversary, López de Heredia rehabilitated an old store that the founder took with him to the Brussel’s World Fair in 1910, which had been sitting disassembled ever since. The new pavilion designed by Pritzker Prize winner Zaha Hadid contains the old store, as well as a tasting room. Hadid created a dramatic white triangular structure that serves as a “bridge between the past, present, and future evolution of [the label’s] world-famous bodegas.” Its avant-garde pavilion fuses modern architecture with the winery’s underground cellars, which are from an old railroad that connected the winery directly to Bordeaux in the 19th century. 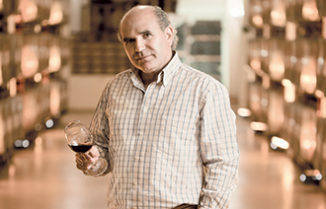 The massive Viña Real was one of Rioja’s first modern wineries, and came courtesy of Bordeaux architect Philippe Mazières, whose father was a winemaker. To build it, a corner was cut out of a table-top mountain. Two tunnels were bored 120m deep into the remaining rock (called Cerra de la Mesa) using the machines that excavated the tunnels of Bilbao’s metro system. Then, a 56m-wide barrel-shaped building was sunk into the leveled-off corner. In the center of this twin-story circular room is a revolving crane arm that moves huge vats around, using gravity to pour grape juice from one to another, in a very winery-meets-Bond-villain-lair type of way. 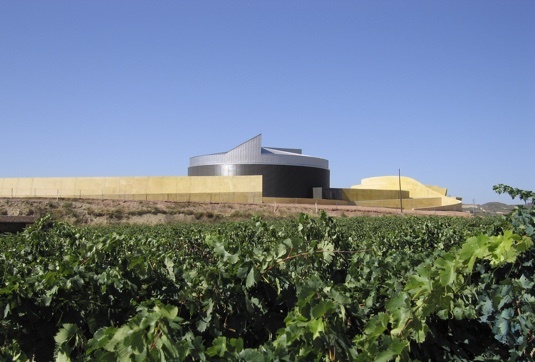 Bodegas Ysios was designed by Santiago Calatrava as a symbol of the new Rioja, and was inspired by the rows of casks used to age wines. It is named after the two Egyptian gods that are closely linked to the world of wine, Isis and Osiris. 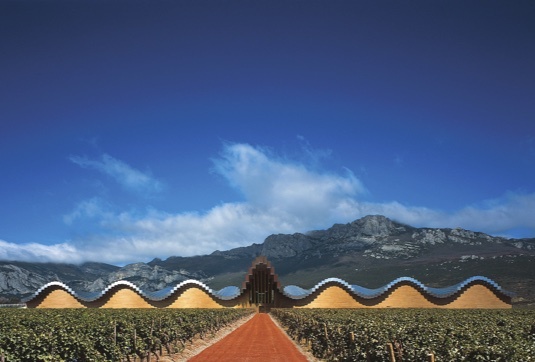 The winery building is a ruled surface wave that combines concave and convex surfaces, mimicking and blending with the rolling Sierra de Cantabria mountains behind it. The style of the interior is also very avant-garde. 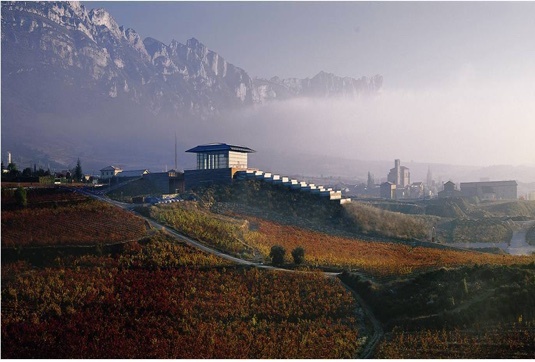 Built 35 meters underground, this winery was designed to harness gravity and avoid the use of hoppers, pumps or mechanical methods of any kind that might damage the grapes or the wine. As much a work of art as the wine it produces, Bodegas Baigorri is one of the landmark buildings in Rioja Alavesa. A glass box, empty to emphasize the environment, is fully adapted to the existing topography and the work carried out underneath its surface.